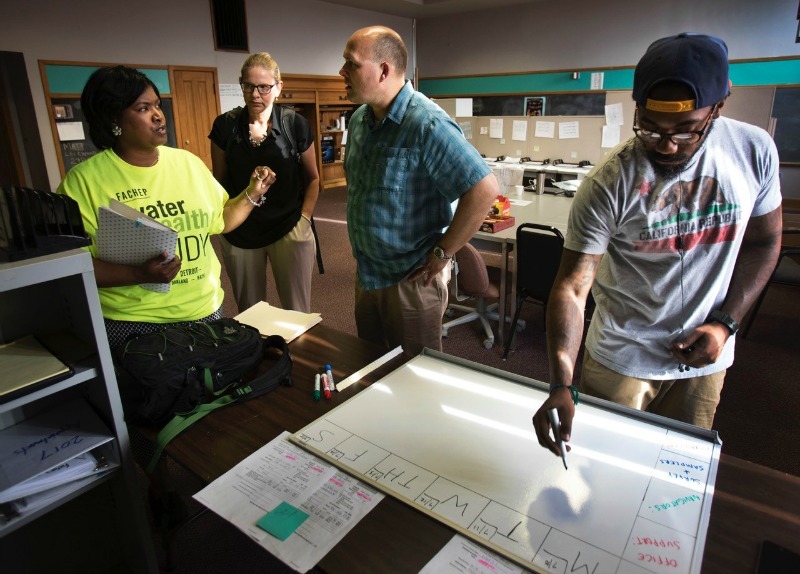 Kwesi Reynolds (first right) drafts a work plan while Nasienka Francis (first left) discusses the project with WSU engineering professor Shawn Mc Elmurry and UM engineering professor Nancy Love. Photo: Marcin Szczepanski, University of Michigan. Based on a detailed statistical analysis of multiple datasets, the Flint Area Community Health and Environment Partnership (FACHEP) research team found that the majority of Legionnaires’ disease cases that occurred during the 2014-15 outbreak in Genesee County, Michigan, can be attributed to the change in the City of Flint’s drinking water supply to the Flint River. The researchers also found that the specific strain of Legionella isolated from Flint residences as part of FACHEP’s sampling in 2016 is not readily detected by common diagnostic tests for Legionella. These conclusions are part of two peer-reviewed scientific reports authored by FACHEP and recently published in the academic journals Proceedings of the National Academy of Science (PNAS) and mBio. The researchers conducted an exhaustive analysis of data on Legionnaires’ cases in Genesee, Wayne and Oakland Counties from 2011 to 2016. FACHEP researchers determined that in 2014-15 there was an increase in the risk of acquiring Legionnaires’ disease across the Flint water distribution system that is consistent with a systemwide proliferation of Legionella bacteria. An estimated 80 percent of Legionnaires’ cases during this period are attributable to the change in water supply, according to the article in PNAS. Data indicate that the Legionnaires’ outbreak at a local hospital alone could not account for the increase in Legionnaires’ disease cases that occurred in Flint during the water crisis. 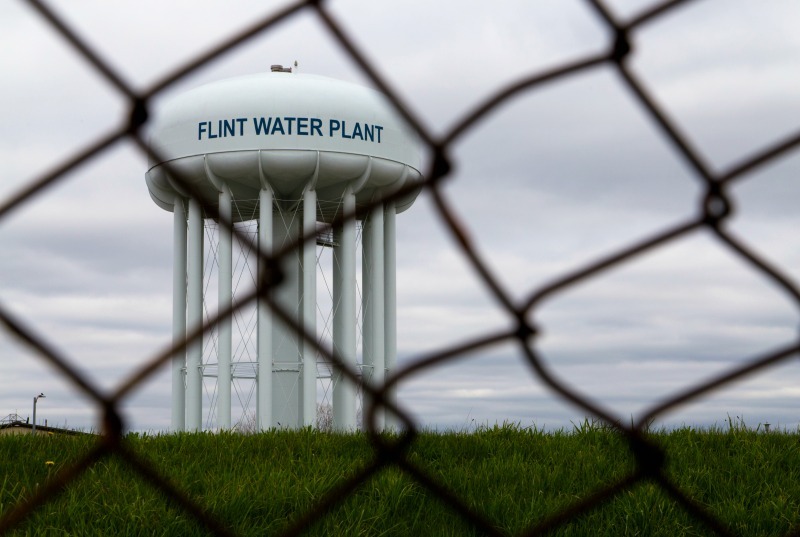 During the water crisis, the likelihood of Legionnaires’ disease occurring in communities adjacent to Flint also increased, probably due to the number of people who commuted into Flint. Photo: Evan Dougherty, University of Michigan, College of Engineering, communications and marketing. After the city returned to the Lake Huron water source supplied by the Great Lakes Water Authority, the risk of a Flint neighborhood presenting with Legionnaires’ disease retreated to historically normal levels. While Legionnaires’ disease is typically associated with Legionella pneumophila strains classified as “serogroup 1,” the majority (16 out of 18) of strains isolated from Flint residences were closely related serogroup 6 Legionella pneumophila strains, according to the article published in mBio. In the United States and Europe, more than 90 percent of Legionnaires’ disease cases are diagnosed using a urine test that readily detects serogroup 1, but not serogroup 6 or other serogroups of Legionella bacteria. “In laboratory tests of disease risk, the serogroup 6 strain isolated from Flint and Detroit homes resembled the serogroup 1 bacteria obtained from Legionnaires’ disease patients in Southeast Michigan,” said Michele Swanson, professor of microbiology and immunology at the University of Michigan Medical School and senior author of the mBio article. 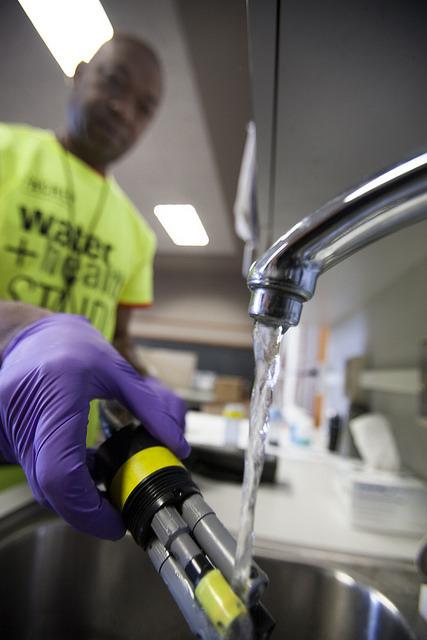 The strains obtained from Flint and Detroit residences are similar to bacteria isolated from Legionnaires’ disease patients in other countries, as judged by their genetic fingerprint. One Legionella pneumophila strain isolated from a Flint residence is genetically similar to the serogroup 1 bacteria obtained from Legionnaires’ disease patients in Southeast Michigan. Whether this small group of patients became ill after inhaling contaminated water in a Flint home can be assessed by more detailed analysis. The study did not determine whether serogroup 6 Legionella pneumophila contributed to pneumonia of unknown origin in Southeast Michigan. Other studies have found that serogroup 6 can cause Legionnaires’ disease. Staff member Georges Manard calibrates a water testing instrument on July 7, 2017, while Flint residents and members of the Flint Area Community Health and Environment Partnership (FACHEP) meet at their headquarters to gather supplies for a day in neighborhoods, sampling water. Photo: Marcin Szczepanski, multimedia director, University of Michigan, College of Engineering. Dr. Lawrence Reynolds, a Flint area pediatrician and member of Governor Snyder’s Flint Water Advisory Task Force and the Flint Water Interagency Coordinating Committee, noted that the FACHEP group engaged the community in its research efforts. The FACHEP team conducted multidisciplinary research in Flint through funding from the Michigan Department of Health and Human Services, the National Science Foundation, the National Institute of Environmental Health Sciences, – part of the National Institutes of Health – Wayne State University, the University of Michigan, and Michigan State University. Additional information about Legionnaires’ disease can be found at the Genesee County Health Department website, the Michigan Department of Health and Human Services website, and the Centers for Disease Control and Prevention website.